Find your center. Trust your gut. Strengthen your core. Breathe into your belly. Activate your Dan Tian. We reference the center of ourselves in a variety of ways, each of which highlights the vital role it plays in our well-being. It's the home of our internal compass, the intersection of heaven & earth, the ethereal womb from which life springs forth. A sanctuary wherein we can retreat & reconnect to our truth. The place from which we realign & cultivate a calm self-awareness. It's where we digest what comes at us & through us. In Daoism & Chinese medicine, the region below & behind our navel is referred to as the lower Dan Tian, which translates as "elixir field", "energy center", or "sea of qi". It is the residence of the deepest energies of the body & the source of all movement. When we mindfully direct our attention to this area, whether through meditation, acupuncture, qi gong, or otherwise, we can nurture & tend to the roots that anchor & sustain us, & encourage the transformation of our Jing essence into the elixir of Qi that animates our lives. On a body level, this can facilitate & regulate digestion, boost fertility, strengthen & energize the body-mind-spirit, support the immune system, & preserve health & extend life. When we consciously nourish our Essence & cultivate the Qi in our lower Dan Tian, we are tuning in to our "gut". It's a trite & homely term for a stunningly dynamic, consequential, diverse, & vital system. Learning to listen & trust our gut is more important than we may realize. Our gut feelings are very real. Research today suggests that there’s an entire ecosystem of microorganisms in an expansive network operating in our guts (i.e., the gut microbiome). This network is now what scientists are calling our "second brain". It's filled with over 100 million neurons. Neurons are specialized cells that transmit information to other nerve cells. Our guts actually influence our mood & overall psychoemotional state. Having a healthy gut can not only allow us to digest what we eat & drink, but to process all forms information that comes at us in a new & intelligent way. A harmonious gut can provide protection from feelings of hopelessness, depression & anxiety. Clearly what we put into our bodies impacts how we feel & yet it is not the whole picture. When we are mindful & paying attention to our second brain’s activity we can begin to notice when we are present, calm & at ease, or when we feel fragmented & disregulated. One of the best indicators of this is our breath. Take a deep breath right now as you are reading this. Notice the subtle feeling of wellbeing this likely created. The breath allows us to shift from our amygdala (flight or fight mode) to our prefrontal cortex where we can access solutions to whatever is coming at us. It sends the message that allows us to calm down; there is no saber tooth tiger in the room. It allows us to shift from the sympathetic nervous system to the parasympathetic. The Vagus nerve, the longest cranial nerve with the widest distribution throughout the body, travels down through the brainstem to influence parasympathetic control of the heart, lungs, & digestive tract. It carries information bidirectionally - downstream from the brain to the organs, & vice versa. Body sensations & gut instincts are our intuitive sense getting transferred up to the brain by the vagus nerve. This nerve impacts memory, prevents systemic inflammation, helps us breathe, & most importantly helps to initiate & regulate our body’s relaxation response. So eat mindfully, exercise, relax, & replenish regularly, nourish your microbiome, laugh often, find one thing each day that brings you joy, & BREATHE. Reach out when you need support - community & communion are essential to our well being. We are here for you. Adaptogens are non-toxic herbs that "can stimulate, activate, or promote a response [to stressors] in multiple nonspecific ways, including the building of a reserve of adaptive energy.” They posses a bidirectional intelligence which allows them to either restrain & temper any hyperactive functioning or bolster & invigorate the functioning of underactive systems in the body on the cellular level, especially the neuroendocrine & immune systems! * They can guide the body back into a state of equilibrium, even in the midst of the seemingly ceaseless onslaught of myriad stressors in our modern world. These beauteous truffle babes are filled with adaptogenic tonic herbs, raw cacao, & magic. Warning: these may incite high vibes, enhanced immunity, upgraded cognition, rejuvenated hair/skin/libido, overall well-being, & long-lasting bliss. Consume at your own risk 😉 Cheers to healthy pleasures & superfood mavens Sun Potion for procuring the highest quality organic/wild crafted herbs! Today's batch of treats feature Anandamide, He Shou Wu, Mucuna Puriens, & Tocos. Yum. You can come try some of these at our Healing Arts center where I intend on offering samples of what I'm making from time to time! You can also purchase the herbal powders (as is, or in custom combinations put together for your unique constitution) at our clinic & use this little recipe I've whipped up (see below) so you can make them at home! I used: He Shou Wu + Mucuna Puriens + Maca; but some other great options are: Chaga, Cordyceps, Reishi, Ashwaganda, Schisandra, Pine Pollen, etc. there really are no limits! 4. Cover a cutting board with parchment paper & spoon the chocolate mixture out & roll into smooth balls. 6. Roll the balls into the superfood toppings (you can put the toppings into the bowl one-by-one & toss balls until covered. Alternatively you can add on your choice of superfood toppings in various corners of the parchment paper on your cutting board & roll balls into them by hand). I know the holidays are fast approaching, and I am not trying to ruin all the fun, but I do believe that having a few guidelines to follow when facing the feasts ahead can help to keep you healthier. The tips in this post are mainly applicable to when you are feeling run down or when you are actually sick; however, the way you treat a sick system is usually optimal for illness-prevention as well. Main point here: Try and make choices about what you eat with care, mindfulness, and moderation, and your system will thank you for it. And above all, enjoy what you eat! Savoring your food encourages proper digestion. Chinese medicine has observed the influence of diet on health for thousands of years, and nutritional advice is often incorporated into my healing protocols as an acupuncturist. In the Chinese medical view, diet is intimately connected to the proper functioning of all systems, and impacts the quality of your blood, energy reserves, and immunity. What we eat, as well as how we prepare and eat it (cooked or raw for example), matters big time. Diet is a tricky part of supporting immunity because it isn’t as simple as just wanting to eat right. Most of us want to eat well and to feed our kids a healthy, immune-supportive diet. The break is usually somewhere between the wanting, the doing, and the know-how. All sorts of things get in the way of putting real food on the table on a regular basis: time, money, interest, knowledge, overwhelm, and did I mention, TIME? The fact remains though, dietary choices are always important, especially when you are trying to stay healthy or slogging through an illness. What you put in your system holds even more weight when your body is run-down, since it can make the difference between maintaining wellness and plunging headfirst into a cold or flu. Cold and raw food is damaging to the root of our immunity, the gut, which we acupuncturists refer to as the Spleen organ system. The Spleen appreciates and thrives on a diet of primarily warm foods, versus the ice water and salad-obsessed Standard American Diet (aka SAD – a fitting acronym really). This is especially true in the winter, when the Spleen is up against environmental chill as well as cold in our diets. General fatigue and muscle weakness, bloating after eating, and easy bruising are all signs of Spleen weakness, so taking a break from cold and raw food can support proper functioning of the Spleen, rather than taxing it further. Old wives tale-y though it may be, soup is an incredible food. It is, wait for it, warm and can be filled with any number of nourishing ingredients. Miso soup with plenty of scallions is good at the onset of a cold or fever, and chicken soup with veggies has cold-fighting properties. There is a special kind of soup called bone broth that is a mainstay of traditional diets the world over. Bone broth is a powerful nutritive and immune tonic. Stay tuned for soup and bone broth recipes on my site this winter! 2) Cut down on the refined sugar. Sugar is delicious (duh), but it is also bad news when consumed in inappropriate quantities. In moderation, and in health, our bodies can metabolize some amount of sugar (especially of the fruit and honey varieties). But if you are stressed, sleeping too little, and eating poorly, then sugar becomes a bad guy in and of itself. Sugar lowers your immune power and generates heat (Chinese medicine-ease for inflammation) in the body. If you are desperate for something sweet, go for an apple drizzled with honey and cinnamon or a few squares of real-deal dark chocolate (Endangered Species and Theo are two of my favorite brands). 3) Dairy is phlegmy and therefore not the best choice when you are also phlegmy. Dairy is a cold (see #1 above) and damp-producing food in the eyes of Chinese medicine. Barring an allergy or intolerance, dairy can be a healthy part of the diet, when consumed in small to moderate amounts (same as #2 above), especially when the dairy products are organic and varied (choosing goat and cow milk cheeses for example). But when you are dealing with phlegmy conditions, manifesting as sinus congestion or phlegm anywhere in the respiratory tract, from the nose to the lungs, then removing dairy from the diet will make it easier for your body to clear the gunk that is already there. IN SUM, if you are experiencing the beginnings of a cold in the form of a runny nose, scratchy throat, sneezing, fatigue, or even just feeling "off," then give up the raw/cold food, sugar, and dairy for a bit. By choosing foods that are clear, light, and immune supportive (and eating the not-so-healthy stuff in moderate amounts), you will lighten the digestive load and your immune system will be respond in kind. While I am grateful for the warm and sun-drenched life here in Southern California and how we never lack for idyllic days, one of the main things I miss about living on the East Coast is fall. I miss fall with a deep, empty ache in my gut. I crave the crisp September air that displaces the brutal, heavy heat of summer with a laughable swiftness. I miss simply needing to wear a scarf and sweater occasionally. Each of the five Elements in Chinese medicine ~ Fire, Earth, Metal, Water, and Wood ~ is associated with a season. For us Metal types, we resonate most directly with autumn. So it gives me some consolation that my longing for crackly autumn leaves and drizzly skies is rooted in my constitution. It’s not that I don’t appreciate the sunshine, but I am wired for clouds and apple season. Sorry, beaches, it’s not you…it’s me. 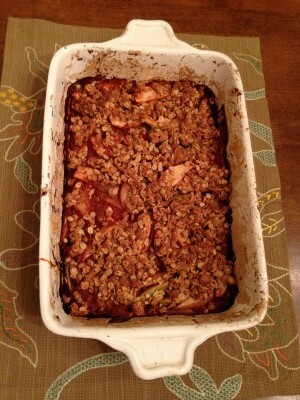 In order to simulate a little bit of fall in my LA kitchen, I recently made this delicious and nutritious fruit crisp. There are lots of reasons that I love this recipe. It is immune boosting for sure, and inspires cozy feelings with its cinnamon-y smells. It is flexible ingredient-wise and can thusly fit any number of dietary persuasions or restrictions. It is equally edible as a vegan treat or made with butter, sweetened with maple syrup or deriving its sweetness purely from the fruit. I used organic apples and pears because that is what I had in the house, but raspberries or blueberries are a welcome addition. The acupuncturist in me loves this crisp because its flavor profile is balanced, and highlights ingredients like apples and pears that strengthen the organ that is most taxed during the fall and winter cold season, the Lung. Warming cinnamon and ginger harmonize the digestive system (the root of all immunity, see this post), and pair perfectly with the tart and cooling lemon juice. Lemon harmonizes the Liver, the organ that mitigates the impact of daily stressors on our body and immune reserves. Cut up apples and pears into slices of equal-ish thickness (keep the peels on to retain fiber and nutrients). Arrange in an even layer in baking pan. Drizzle the lemon juice, honey, and vanilla over the fruit. Next add the cinnamon and ginger. Stir to distribute evenly. Mix oats, flour, salt, cinnamon, ginger, melted coconut oil, and maple syrup in a large bowl. 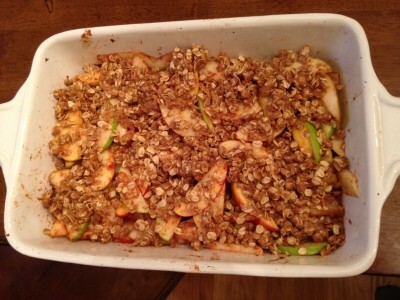 Evenly cover the apples and pears with the oat topping. Bake at 325 degrees for approximately 30-40 minutes, or until the fruit has softened to your liking. Enjoy as dessert, breakfast, or a mid-day snack. Store leftovers in the fridge. It is great hot or cold/room temp. Yum! Elemental Family Focus on Immunity, Part 2: Do You Know Where 80% of Your Immune System Lives? Welcome back to immune prep central! Part 2 of our series is about the relationship between your immune system and your digestive system. The phrase “immune system” might conjure up an assortment of connotations from your high school biology days: bacteria and viruses, innate and acquired, antibody and antigen, and so on. The science-y talk ends here, but the point is there is an even more salient fact about your immune system that most of us haven’t been taught. One of the most important predictors of your immune function is already within you and can have either a hugely beneficial or a dramatically negative influence on your ability to fight off illness. Okay people, drumroll please: 70-90% of your immune system actually resides in your GUT. Your gut is host to your body’s largest population of immune cells, and the proper functioning of those cells relies on a remarkable, and largely uncharted, community of trillions of bacterial cells, known collectively as the microbiome. Those coils upon coils of small intestine house all of the intestinal bacteria that play an essential role in doing the digesting that we are oh so familiar with, but it turns out that the small intestine is the site of the majority of your immune response as well. 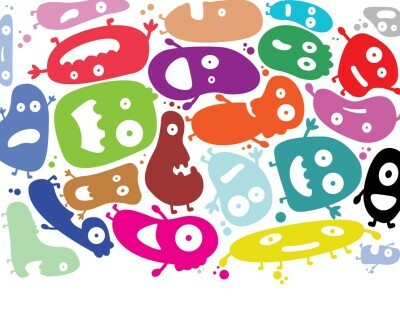 Your microbiome is a vast, diverse, and unique assortment of a multitude of strains of bacteria and other organisms, that essentially make you, you! Turns out, you are so much more than just what you eat. The microbiome consists of a mix of both helpful and opportunistic bacteria. The microbiome is truly a new frontier within us that is only beginning to be explored, categorized, and understood, with incredible and exciting ramifications for health conditions in a wide range of categories, from auto-immune conditions to ADHD to depression. Probiotics are all the rage in the health-o-sphere these days, and for good reason. Probiotics comprise the good guys in your microbiome. Although the majority of them live in your digestive tract, probiotics exert a significant influence well beyond your belly. Probiotics are the key players in overall wellness and maintaining a balanced, healthy system. They rule the roost in three essential realms of your wellbeing: digestion, immunity, and brain function. If you think of your gut microbiome as a garden, then the probiotics are the flowers and the opportunistic bacteria are the weeds. The more flowers there are, the less room there is for weeds to grow. The flowers protect your gut by crowding out the weeds and preventing them from sticking to the gut lining. As explained earlier in the post, your gut is host to your body’s largest population of immune cells. Probiotics serve to amplify and enhance the immune activity at these sites. Probiotics act as an immune barrier in the gut, only allowing certain things to pass into the bloodstream, and blocking illness-causing pathogens. How do you know if you need to take probiotics? Well, most of us do. What type and for how long will vary widely, but if you have ever taken an antibiotic (and I mean ever in your life), then you probably want to explore getting on a probiotic. Thanks for reading and please be sure to check out Part 1 of the series here: http://elementalfamily.com/fall-focus-on-immunity-preparatory-medicine/. We'd love to have you join our virtual Elemental Family to stay in the loop with these types of posts in the future! You can opt-in on the home page here: http://elementalfamily.com. Happy end of summer, friends! 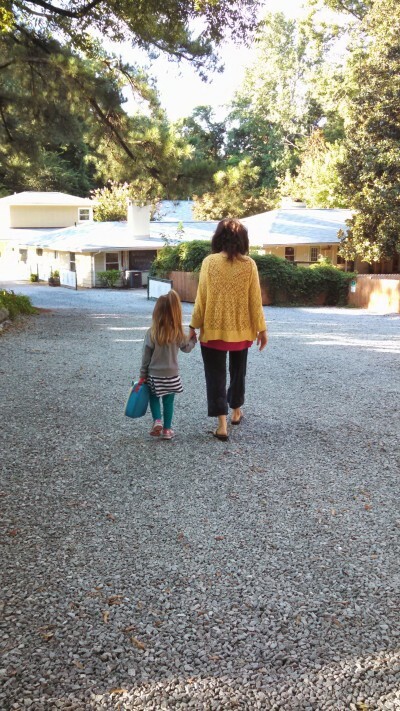 This is a special time in our house because my daughter is starting kindergarten this fall! How the heck did that happen? Just the thought fills me with a myriad of conflicting emotions: excitement for all of the new and enriching experiences ahead of her, sadness for the inevitable passage of time that starting school really brings home, and, to be totally honest, a fair amount of trepidation at all of the germs that are awaiting her in a school environment. As a practitioner who treats both children and adults, I certainly deal with a fair share of germy-ness, but it feels different when I know I won’t be there to make sure my daughter washes her hands before she eats or doesn’t accidentally use someone else’s cup, and so on. In the hopes of tempering my anticipatory germaphobia, we’ve recently started a simple and straightforward immune boosting regimen in my house. Cold and flu season is just around the corner, and Chinese medicine truly shines in its preparatory approach to illness. Preparatory medicine is a unique approach to supporting immunity and it differs in one significant aspect from preventive medicine. Preventive medicine is a buzzword in our ever-evolving healthcare landscape and is focused on early screening, counseling, and other interventions to detect and prevent disease. This is an invaluable practice, especially when it comes to serious and life-threatening illness. Preparatory medicine, on the other hand, is more applicable to the day-to-day illnesses that I see on a regular basis in my clinic, and that many of you parents are more than used to dealing with: coughs, colds, fevers, tummy upset, etc. Preparatory medicine offers the perspective that building immunity is a developmental process. Successfully fighting these types of illnesses contributes positively to the complexity of a flexible and robust immune system. Trust me, as a parent this is a very challenging concept to keep in my brain. No one wants to see their child or partner, or self for that matter, feeling icky and down for the count. It is lousy for sure, but it can help to remember that much of our immune system is acquired over time, so with each illness the body really does get smarter and stronger. So, what does preparatory medicine look like? Now that we have set the appropriate expectations around getting sick, we can move into tools for HOW to prepare the body! Over the next few posts, we will cover dietary, supplement, lifestyle, and wellness massage recommendations. Halloween Doesn't Have to be SUGARY Scary! I have plenty of childhood Halloween memories that revolve around seemingly endless amounts of candy, but the fact of the matter is that sugar has a hugely negative impact on immunity and overall health. I believe that the body can tolerate almost anything when used in moderation, but Halloween is not exactly the most moderate sugary experience for most kids. Here are some easy ways to mitigate all the sugar floating around this Oct 31. Are you Wood, Earth, Fire, Water, or Metal? Discover your Secret Power by downloading our complimentary elemental assessment.